Are you one of the 95% losing forex traders? Did you wipe out your live account several times already? Are you looking for a way on how to stop losing in forex and start making profit? If yes, then keep reading. The solution is in the title already, invest your money in a PAMM account. Instead of trading on your own, you entrust your money to professional traders with years of experience then they trade your money for you. Once they make profit from trading your money, they charge a management fee then you keep the rest including your initial investment. This way you won't suffer the stress and frustration that you experience during independent trading which usually result to losses. Percentage Allocation Management Module or simply PAMM is pooled money from different investors and is used for forex trading. Only the PAMM manager can execute trades in the PAMM account and the investors will just have to wait for the manager to grow the money. Sharing of profits is usually every month so you just have to invest your money, wait for 1 month then see if it grew. The profit share will depend on how much a particular investor have invested in the account. If an investor has 10% of the total funds in the account, then 10% of the profits will go to him minus fees charged by the PAMM manager. Managers charge an average of 20% profit share, so if your investment made a profit of $1,000, then $800 will go to you after the fees, it's actually much better and less stressful compared to independent trading. Is PAMM investment some kind of scam? This question is only for people who never heard of this kind of investment before. But no, investing in a PAMM investment is not a scam, it is legal, and there are a lot of people who are making generous passive income online by investing in this platform. You can go to investment forums or in quora and ask questions to assure yourself. 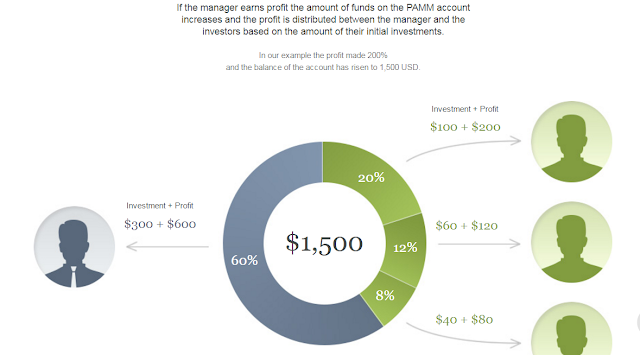 What are the advantages of investing in a PAMM account? 1. Less stress since you won't be trading on your own but instead you will let the PAMM manager do the hard work for you then you just watch your money grow. 2. Significantly lower risk compared to independent trading especially for new traders due to the big difference in experience. Remember that 95% of forex traders are losers and almost all of these losers are beginners who haven't developed the patience and discipline yet to become profitable traders. 3. Time saving, no need to look at the charts and search for candlestick patterns or other kinds of entry signals, you just have to check how the PAMM manager is doing. 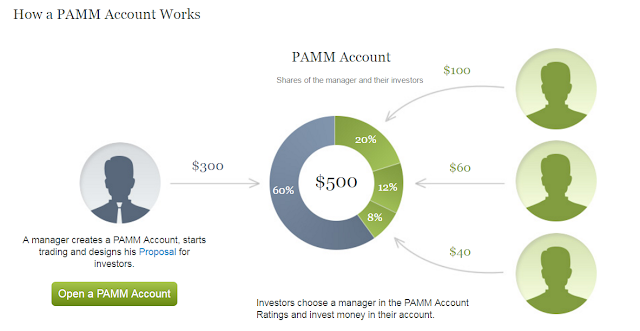 Who should invest in a PAMM account? 1. As the title of this article says, investing in a PAMM account is one of the best solution to "LOSING TRADERS". 2. People who want to make money in the forex market but doesn't have the time to trade. 3. People who wanted to make money in forex before but eventually gave up after wiping their account several times because they realized that trading is not for them. 4. People who want to earn passive income online. What does the PAMM Manager do? gain per month, so if you have a lot to invest but want to minimize your risk, then investing in a conservative pamm manager is a good option. gain per month which is attractive but also risky at the same time due to their high drawdown. So if you're investment budget is just small, then it is recommended that you invest in aggressive managers to grow your money in the shortest possible time while taking the risk into consideration. If you're a new trader, it is highly recommended that you invest 50% of your funds in PAMM accounts instead of using all of your money on independent trading because of the inevitable loss that newbie traders are facing. Try investing half of your funds to your chosen PAMM account and use the other half in your own trading. After one month, see which one made the bigger profit, your investments or your own trading account. Which forex brokers offer PAMM accounts? - There are several brokers out there who offer this kind of service, but there is one who has the biggest network of the top earning PAMM managers and it's Alpari. There you'll find the best PAMM accounts that are already several years old and has a proven track record. - Finding the top earning PAMM accounts is not hard to do because of the rankings. You simply choose the top 5 or top 10 in the rankings then start investing your money. - Another way to find the best PAMM Accounts to invest in is by considering these 4 factors. A high total gain like the one in the picture is no doubt very attractive, it's actually taken from an aggressive pamm manager's detailed statistics. The managers handling these kind of accounts that have very high gains are born traders so you should take advantage of this opportunity that their allowing you to invest in their talents. An account that is already more than a year old with a total gain of more than 100% is an indication that it has stood the test of time. This accounts are good candidates for your investments. A high equity means that a lot of investors have invested in that particular account, it's a proof that the PAMM manager has already gained the trust of the investors through his excellent trading performance. A low drawdown means that the manager is very careful in opening trades. He does not trade recklessly but instead waits for the right opportunity to enter the market which results to less mistakes. But if you are investing in an aggressive PAMM manager, you don't have to look at the drawdown but instead you should look at the total gain since it is normal for aggressive pamm managers to have high drawdowns due to their aggressive style in trading. Note: Investing in PAMM accounts also have risks just like independent trading as PAMM managers also make mistakes in their trades, but the level of risk and stress are much lower compared to independent trading especially for new traders who are just starting to figure out how the forex market works. If you have questions regarding this topic, don't hesitate to ask me and I'll reply asap. Did you know that you can create short urls with AdFly and receive $$$ from every visitor to your short urls.